So here’s what’s going to happen. You are going to read this post, and you are going to think it sounds like a little too much of a fuss for a couple of eggs. But the thought of it is going to linger in the back of your egg-loving mind, and one day you are going to find yourself with a little spare time and a couple of eggs and you are going to say, what the heck! I’m going to try that intriguing butter crumbed poached egg recipe. And you will take just one bite and your world will rock. Egg-wise. 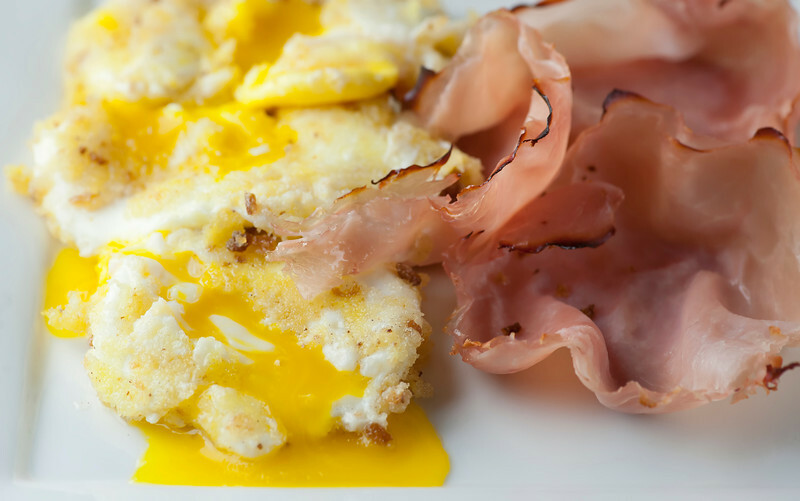 This recipe is adapted from the very wonderful BREAKFAST BOOK by Marion Cunningham, and this book also gave me the lead on the ruffled ham, which I tend to make right before the eggs. Basically you take a slice or two of super thinly sliced ham, crumple it up a little and pop it in a little round ramekin or custard dish. Bake it for a few minutes and it will get all warm and, well, ruffled-shaped! On to the eggs. Poach as many as you are going to crumb, and click here for my favorite way to do that. Then dip the poach eggs in beaten egg and some fresh soft breadcrumbs. Obviously very carefully as you don’t want the poached egg to break. But if you are gentle it will all be fine – I use a little slotted spoon to move the eggs around. Now melt a generous amount of butter in a large frying pan and oh so gently fry the crumbed eggs just until they are golden – a minute or two on each side. Slide them onto a warm plate, nestle some ruffled ham beside them, and oh my my. I hereby apologize for making your poached egg just a little more complicated than it was before…but these are just plain heaven. It’s like getting a mouthful of poached egg and buttered toast all in one bite, but ten times better than any buttered toast and egg you have ever eaten in your life. And you’re worth it! Preheat oven to 350. Crumple two slices of ham into a loose ball and put them in a small round ramekin or custard dish. Repeat with the remaining slices until you have 4 dishes full. Place the dishes on a cookie sheet and bake for 10 minutes. Remove from oven and set aside. Place raw eggs in a shallow bowl, and crumbs in another shallow bowl. Have a piece of wax paper or parchment ready. Using a slotted spoon, gently coat each poached egg in raw egg and then bread crumbs, patting the bread crumbs very gently into place. Place each crumbed egg on the wax paper as you finish. Heat butter in large skillet over medium low heat until melted. Gently transfer eggs to skillet and brown in each side until lightly golden. Remove and serve at once on warmed plates with ruffled ham on the side. Kate, you’ve done it again. This looks like my new favorite recipe for “Oh hey it’s 5pm and I just thought of dinner for the first time let’s make eggs” night. I can’t even believe this. And how do you make ham sound so cute? Ruffled? I just want to pinch his cheek. Okay, update! Apparently it was one of those nights tonight :) So I made these. It was so good! I loved it. I’ll make it again, thanks for the recipe Kate! PS I used the ugly but effective Sous Vide method to poach my eggs: http://thefoodcharlatan.com/2012/04/18/asparagus-and-poached-eggs-over-pasta/ works like a charm! The picture you took here with that egg and ham, makes me want to kinda cry. I am as in love with the egg as much as you are I think. We go thru about 18 in 10 days or so. So today, I just gave in and bought the thirty pack. I gotta really practice the poaching though. It my favorite (or maybe a soft boil or baked). You do them so beautifully.